Bells of Ireland, Protea, Silver Dollar Eucalyptus, Autumn Hibiscus, Orchids, and American Beauty Berries. Sounds like a poem, doesn’t it? It’s actually a list of flowers artfully displayed in a centerpiece created by Ninth Street Flowers for Piedmont Restaurant. And it is every bit as beautiful as it sounds. Ninth Street Flowers has been in the same location on Ninth Street since the 1970’s, but Lea and Larry Wood made it their own in 2003. In fact, they own the entire building that houses their shop and two other iconic Ninth Street business, Ninth Street Dance and The Playhouse Toy Store. Along with a matching grant from the City of Durham, they commissioned the colorful mural that graces the brick wall at the corner of Ninth and Perry. What do Lea and Larry love most about running a flower shop? The independence, for one thing. Initially, Larry landed on the idea of a retail florist shop through a national franchise, but ultimately decided that owning his own shop without all the encumbrances of a franchise was more appealing. Together Lea and Larry came to Durham with the desire to have their own business. Fourteen years later, their journey continues to evolve with the Ninth Street neighborhood. Being part of a lifestyle business has given them a sense of belonging and they appreciate how the shop has brought the Durham/Ninth Street community into their lives. If you ask them about their favorite flowers, they’ll point you towards the lilies produced by Sarah & Michael’s Farm, just one of the local vendors with whom they partner. These lilies are huge and fragrant and come in an abundance of colors – bright white, rich magenta, and sunny yellow, to name a few. As big supporters of the farm-to-table movement that has enriched Durham’s food scene (though in this case it might be referred to as a “farm-to-vase” movement), the Woods are intentional in using local growers like Sarah & Michael’s whenever possible. They also buy from Spring Forth Farm of North Carolina and the Durham-based Flowers by the Bucket. Ninth Street Flowers feels fortunate in their employees – they have five, not counting themselves – and in their clientele, which includes some noteworthy names as far as Durham circles go. Some of these partners include Vin Rouge, Piedmont, and Parazade, as well as Hall Wynne Funeral Home, First Presbyterian Church, and St. Luke’s Episcopal Church. They are proud to be the Official Florist for Duke Athletics, and they work extensively with other departments at Duke University as well, including the Fuqua School of Business and Duke Chapel. 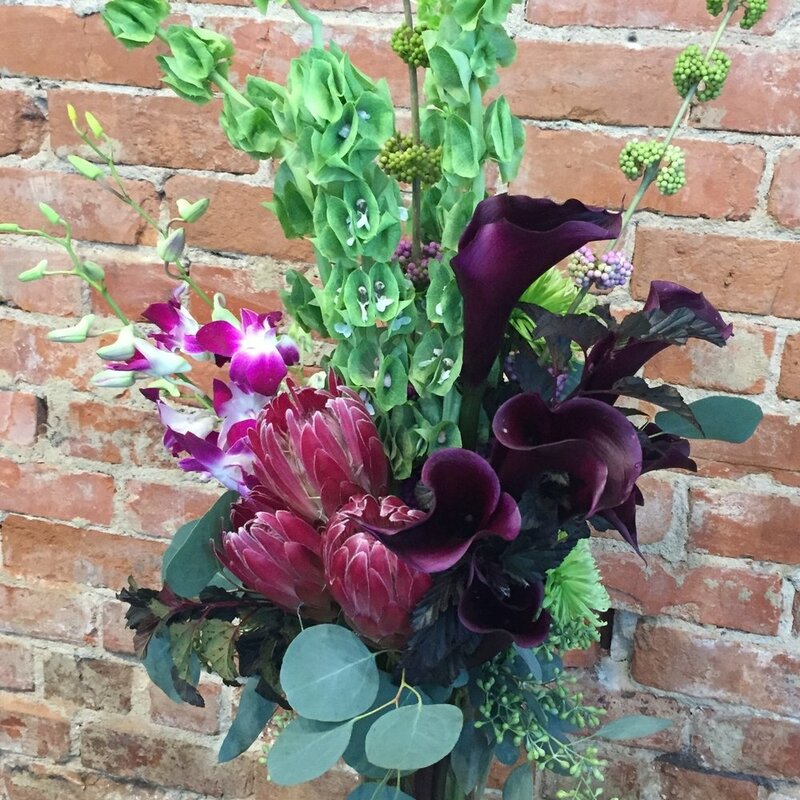 And of course, when Durham folks need flowers for weddings, bar mitzvahs, memorials, graduations, and all of life’s grand celebrations and transitions, they invite Ninth Street Flowers to help make these celebrations unforgettable. In short, the Durham community has been good to Ninth Street Flowers, and, accordingly, the Woods make it a point to be good to the community. Whether it’s providing substantial discounts to local churches, donating to elementary school PTAs, or contributing to the Duke Durham Campaign, Ninth Street Flowers always makes an effort to give back. The support and loyalty of their Durham community has also allowed the Woods’ work to extend beyond Durham to places as far away as Bolivia, where they financially support the Centro Medico Internacional HOPE Clinic in La Paz. This clinic, which serves mainly international residents of Bolivia, uses its profits to fund a multitude of projects that help meet the basic needs of Bolivia’s poorest residents. Lea and Larry are hoping that they will have more opportunities in the future to build on the kind of work they have been doing in Bolivia. While Mother’s Day and Valentine’s Day are big events in any flower shop, Ninth Street is proud to say that its own flower shop caters to its clients all year. This is a little flower shop with a big heart, deeply rooted in the Durham spirit of giving back as you grow. Can a love for trees be the guiding force behind a new career path as a gallery owner? For Sidney Cruze, that may just be the case. Before purchasing Zola Craft Gallery in August of 2014, Sidney worked as a freelance writer researching environmental topics. Among her favorite topics to research? Beech trees. Many of the books she reads in her free time are about trees as well – The Forest Unseen and The Songs of Trees, to name a couple. And during a tour of her gallery – which carries work from more than 55 North Carolina artists – she just might gravitate towards something like the gorgeous tree tiles from Po Co Paper. Sidney smiles as she picks up her favorite of the tiles and tilts it towards the light. The tiles – made from 100% post consumer fiber and framed in rough-cut lumber – are portraits of living trees – real trees the makers see in their everyday lives. This kind of eco-conscious, earthy vibe is a common theme in the gorgeous art displayed throughout the Zola Gallery, all of which is curated by Sidney herself. Of course, it isn’t just a love of trees that led Sidney to her work as gallery owner and curator. She also loves art and the process by which it is created. As someone who studied ceramics herself at Claymakers in Durham, she understands and appreciates the process of making pottery. Sidney knows that even a simple piece can be challenging to make well. There are many aspects of the artistic process that you can’t see in the final product, though the evidence of fine craftsmanship is there in the details. Knowing the artistic process helps people to understand and appreciate those details even more. In the same way that she once did research for her freelance writing gigs, Sidney loves researching this artistic process. She shows off a vase made by potter Liz Paley and describes how Paley created it using a pottery wheel, a pastry crimper, and a heat gun. Sidney also shares that the earrings she is wearing – gorgeous pearl-like stones in a simple cascade effect – are actually cast metal. Sarah Richardson, the California artist who makes them, heats up the metal to get the effervescent, shimmery finish that is reminiscent of pearls or oyster shells. So, the real reason Sidney rarely takes a day off isn’t because she can’t, but because she doesn’t want to. The stories she hears from makers and her connections with the Durham community are what make her job so rewarding. Even when she is traveling for leisure – say to Asheville or Virginia – she is checking out new galleries and craft shows and meeting makers. She is always on the lookout for that perfect piece that will fit right in to the shop. What does she look for? Textures, for one thing – silky wood or hammered metal. Excellent craftsmanship, for another – evidence that the piece is well made and thoughtfully constructed. Sidney also loves to buy art that is functional – things you can use in your home every day, like cutting boards, serving dishes, vases, and jewelry. On top of all that, Sidney asks herself a few questions when choosing what to keep in the shop: Is it beautiful? Will her customers fall in love with it? Does it tell a story? Favorite Travel Destination: Sidney and her family make an annual trek to the Virginia Creeper Trail where they spend the weekend biking and camping. Favorite Music: Like her Ninth Street pals Emily Wexler and Deb Nickell at Cozy, Sidney is a big fan of Eva Cassidy. She also loves Tift Merritt, Van Morrison, Mandolin Orange, and Dire Straits. Favorite Stress-Reliever: Swimming. If she’s not at the gallery or seeking out new art to display there, you might find Sidney swimming laps at one of Durham’s local pools.